The first strategy pillar we will discuss in an Esports team GTM strategy is focused on Team. The Team Strategy should be developed as a tool to position your org expansion for future success by introducing them in the best possible light, raising your players on a pedestal and providing incentives for fans to learn more about the team and follow them. This article is the second in a series (Part 1 ) focused on esports marketing and go-to-market strategies. Throughout the month I will be looking at each of the pillars discussed in Part 1 and breaking those down into smaller discussions to help you identify what approach is right for your organization. 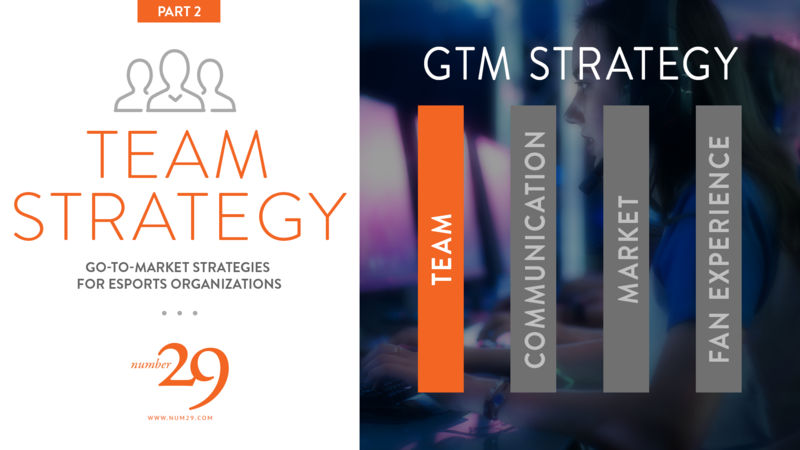 The first strategy pillar we will discuss in an Esports team GTM strategy is focused on Team. The Team Strategy should be developed as a tool to position your org expansion for future success by introducing them in the best possible light, raising your players on a pedestal and providing incentives for fans to learn more about the team and follow them. Your team is your product. Imagine if you were to package up your team and sell them to esports fans in a store. How would you package them to be immediately recognizable to fans? What is the team storyline? What do you want fans, media, and broadcasters talking about? What makes your team better than other teams on the market? Is it a player, a coach, a unique synergy? What makes this team unique vs other teams? Backstory? Who are your main competitors? C9? TSM? FNATIC? How are you going to gain market visibility and steal mindshare from your competitors? What promotions can you offer fans to make your team worth investing in both emotionally and financially? Limited edition Team Jerseys? Twitter giveaway? Having clear answers to the questions above can provide you a solid foundation for your go-to-market strategy. By understanding who you are(or want to be), allows you to easily begin developing the remaining three pillars of your strategy. I feel that most of the time, the team is represented as secondary to the org in the current esports model. I understand this. Most esports organizations are vying for the audience’s attention, and are working diligently to build recognizable (and lasting) brands. However, in some regards, this is a broken approach when it comes to esports. Often I am involved in conversations drawing parallels between esports teams and traditional sports teams. The problem with this comparison is that traditional sports have been established around unique brands, built on a foundation of geographical fandom. This narrow focus allows the professional teams to have very clear identities of who and what they are. Esports, however, has approached this problem from the standpoint of one org to rule them all. They don’t care if you aren’t interested in the H1Z1 Pro League, you’re going to have to hear all about it because you happen to like their CSGO team. This fractured communication results in a dilution of team branding and core messaging. We will discuss this problem more in depth in part 3-Communication Strategy. Answering the questions above to understanding who you are (or want to be), and who your fans are, will provide you the necessary information to build compelling narratives for promoting your team. I think it is easy for an org to start a new team, and just assume, well, we’re Cloud9 so that’s all that matters. And, let’s be honest, for Cloud9, yeah, they have established one of the leading brands in esports. They have a great identity that’s instantly recognizable, a pedigree of success that provides them mindshare, and the resources to build engaging content and marketing when they enter a new game. This credibility gets them invited to participate in new leagues such as the Clash Royale League and the H1Z1 Pro league because of that brand, and potential viewership they can bring. However, unless they actually position their H1Z1 or Hearthstone teams to be worth caring about, they won’t bring as much viewership as the publishers hope. That’s because gamers care about the games they play unless you give them a reason to care about something else. Seems obvious? I’d think so, yet why are professional esports orgs not positioning their teams at the forefront of their communications? They are leaning so heavily on brand equity, they are leaving themselves vulnerable to competitors stealing their fans attention because they are not establishing their teams as worth caring about. I pay attention to the LCS because it’s esports and I want to know what is happening throughout the industry. I don’t really follow any of the teams or really care because I don’t play League of Legends enough to be passionate about it. That is until 100 Thieves interrupt my weekend, grabbed my attention and made me care about who they were, where they came from, and where they were going. I am sure I am not the only one that took notice this weekend. Nadeshot places the team at the front of their communications, provides a narrative around who they are, and breaks out of the mold of esports branding. The Heist series is a great example of including fans in the narrative, showing the process of building the team, the ups and downs that go along with it, and creating an emotional connection. It also doesn’t hurt that 100T faced Team Liquid in the finals, to really help cement this underdog story through to the end. Which one of those tweets makes you care? As you begin to build your go-to-market strategy for your next team, consider who you want them to be. Not only will your fans respond, but I expect your team will appreciate it too.